Each client’s wants and needs are unique, so the first step when working together is a “Get to Know You” session. From there we will develop a plan that best suits your needs. 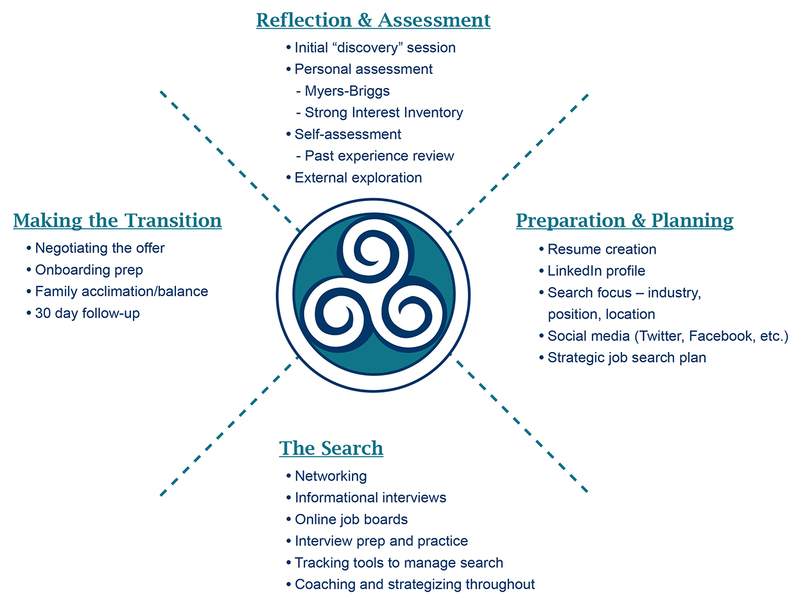 The 2nd Career Consulting Process© covers all aspects of a career exploration and job search. Click on or hover over a Process area to learn more. The 2nd Career Consulting Process© covers all aspects of a career exploration and job search. What type of a position is a best fit for my interests and skills? Should I stay in my current career or is now the time to try something new? How do I find an organization that has an environment or culture that will bring out my best? We can work together to figure out the answers to these questions by using a number of assessment tools, including on-line assessments like Myers-Briggs Type Indicator® and Strong Interest Inventory®, doing some self-assessment work and/or involving “your village” as you “explore” your options. Having the right “Tools” for your search, such as a contemporary and compelling Resume and a strong LinkedIn profile are critical for a successful job search. Depending upon your career focus, social media can also be an essential element of your job search process. Whether you’re a novice or an expert, we’ll discuss how to use LinkedIn, Twitter, Facebook, etc. in your search.Most importantly, we’ll work together to define the various components of your job search, set weekly goals and make certain that we develop a plan for your search that is both strategic and realistic. Today’s job search is incredibly complex. Both the search itself and all the hoops you may have to jump through during the interview process to receive that desired job offer. Having a Strategic Job Search Plan which includes networking, informational interviews, interview preparation and coaching throughout the process can be the difference between a successful search and a long drawn out and frustrating experience. No matter the level of position you’re seeking, all job offers have some wiggle room for negotiation. While salary and contingent compensation are what most people consider, both paid time off and a flexible work schedule are just two of the other areas for potential negotiation. We will role play and discuss how you might best approach your new employer, ensuring a positive interaction with the potential for a successful “ask”. Once the offer is accepted, the anxiety of starting a new job can set in. I’m available to not only help you prepare for those first few days, but also coach you through a successful onboarding process – 30, 60 or 90 days into your new role.